Net zero is great, but to be a real show-off today, a building needs to be net positive—actually improving the availability of energy, enhancing water quality, and even removing waste from the environment. That’s the ultimate goal for Georgia Tech’s Living Building, a 42,000-square-foot education and research facility slated to open in 2019. The name is a nod to the Living Building Challenge certification the school hopes it achieves. It’s easily the toughest environmental accreditation on the market, and early renderings from a design competition reveal some of the ways Tech and its architects from Lord Aeck Sargent and the Miller Hull Partnership might make it happen. The most challenging piece of the puzzle? Finding the right construction materials. Living Building Challenge certification forbids the use of anything that harms the environment in the manufacturing process. It means even basic PVC pipes won’t be usable on the site. The school is still exploring how to source materials, but this, too, is wrapped into the goals of the Living Building Challenge—to create a market for buildings that are sustainable inside and out. This design gets its name from the deep overhang that enables the solar-covered roof to capture more sunlight—while providing shade below. 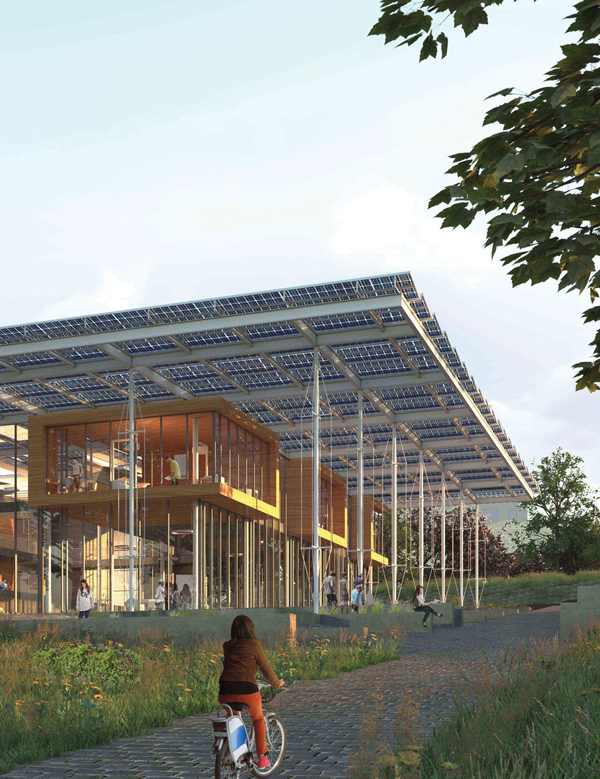 Solar is critical to Living Building certification, which demands that all energy be produced on-site. The solar panels tip up to face south—the ideal direction for capturing sunlight. Natural ventilation is a great way to reduce energy use, but pollen often stands in the way. Tech’s designers are looking into systems that would filter the air with water. The building is set against a linear park, which follows now-buried rivers and will include features like rain gardens to reduce storm water runoff. The designers envision the retaining walls serving double duty as areas for gray water treatment. North-facing windows let in light without the kind of heat you get from, say, west-facing windows. That saves on AC in the summer.